I love to save money and I wanted to share my passion for saving money with others online and from the comfort of my own home. My blog, The Frugal Free Gal, started as a hobby in 2009. I was a stay at home mom and found blogging to be a great way to spend my time when my baby was napping. A few months into blogging, I was networking with other bloggers when I discovered a secret! Many of these blogs that I had grown to love were making money from their websites. I wanted to do this, too. Why not? It would be a great way to earn extra income while staying at home with my daughter. I continue to work from home and find new ways every year to improve or monetize my website. I even turned what I do into a business, BSC Media, LLC. BSC = my initials! During this blogging journey, I’ve had several friends ask about starting a website of their own. The biggest questions were, “How do I start a blog,” and “How do I make money from a blog?” After years and years of doing this, I felt that it was time to write a post about it and share it with everyone. This post is way overdue, but very important to share. My goal is to help others learn how to start their own websites and monetize them, too. Now, here’s something important. This is not a “get rich quick” kind of thing. It took me a few years and HOURS of time building my websites before I started noticing a nice profit. To this day, I still spend a lot of time learning and studying ways to improve my business. 1. Find a topic you are passionate about. To start a website, you’ll want to choose a topic that you are passionate about. What is something you love? What topics do you absolutely love sharing with others? Do you have parenting tips? Start a parenting/mom website. Do you love to cook and share recipes? Consider starting a food blog. Love to save money like me? Maybe a blog about saving money or finances is right for you. There are so many options out there. Whatever niche you choose, choose something that you will have fun writing about. You don’t want to start a website and dread writing on it everyday because the niche you chose does not interest you very much. My websites are about saving money and tips for busy moms. 2. Pick out a blog name. Once you have your topic of interest, you’ll need to brainstorm names for your website. For this website, I chose “The Frugal Free Gal” because I’m frugal, and I love free stuff! I’m also a gal, so it just worked. I thought the gal at the end of frugal and the Gal at the end of the name was catchy. For my mom website, I chose Mom. Wife. Busy Life. because I’m a mom and wife, and a pretty busy mom and wife, too! 3. Sign up for hosting and choose a domain. Hosting is like rent. You are paying for your site to have a home online. I recommend signing up for an affordable hosting service. If you do not feel comfortable setting up your own website, you can always hire this work out to a family member, friend, or other tech guy/gal that knows what he/she is doing. Don’t feel bad about it — I hired help because I’m not good with all of this back-end stuff! I always recommend having 1-2 good referral names on hand in case you need tech support with your website! They come in handy when your site is broken or when things need to be fixed and you are aren’t sure how to fix the issues yourself. 5. Find a good designer. You’ll want your website to stand out from the rest and be visually appealing. Hire a good designer that can help you customize your website the way you want it – from color choice, to logos, to fancy buttons, etc. You name it, your designer should be able to help you create a beautiful website. Laura at Pixel Me Designs designed all of my websites: The Frugal Free Gal, Mom. Wife. Busy Life. and BSC Media, LLC. 6. Start writing great content. Once your website is all set up and ready to go with a great design, you’ll want to start creating great content. Write content that stands out from the rest. Try to remember that adding value is key. Create evergreen content that never goes out of style and can be recycled years from now. 7. Connect your websites to social media and build readership. Now that you have an amazing website that you want to share to the world, you’ll want to make sure you create social media networks that connect with your website. My favorites are Facebook, Twitter, Pinterest, Instagram, and Google+. Share your content on your social media outlets and tell all of your family and friends about your new website! Now that you have your website ready to go and you are creating content, you can start to monetize your website. You can monetize your website with ads, affiliate links, sponsored posts, and more. Below are the main ways I monetize my website. To get started on monetizing your websites, check out the links below to find the affiliate networks that are right for you. There’s several to choose from, so I listed mine in order based on what I earn in each category as well as my favorites to use. Disclosure: Some of the links below include my referral link. There you have it! 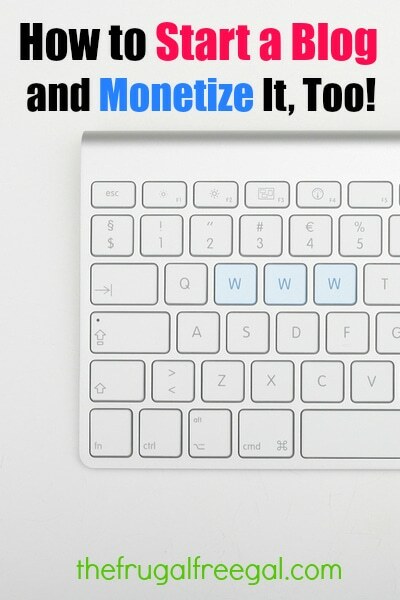 You have all of the best tips and tools to starting your own blog and monetizing it, too! Do you plan to start a new blog any time soon? If I click on these links will you get a commission. I am all about helping other moms. I didn’t see a disclosure within the post so I want to make sure.. Some of the links in this post are my referral links, if the affiliate offers a referral program. Not all include a referral link.